I think I’ve seen every season-ender for my shows except Acchi Kocchi. Now I’m ready for the deluge! 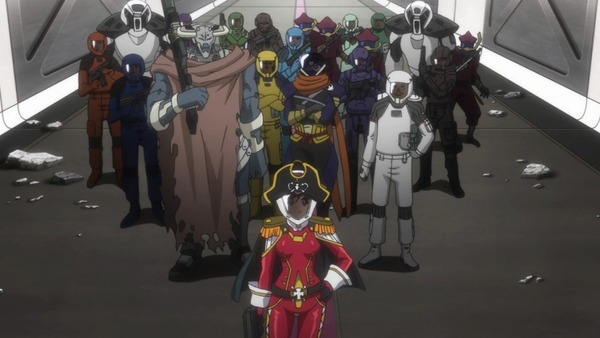 The big fight in the Moretsu Pirates finale is underwhelming, but in a different way than usual. A great start, though. The Grand Crosses didn’t put up much of a fight, really. … Which never comes. 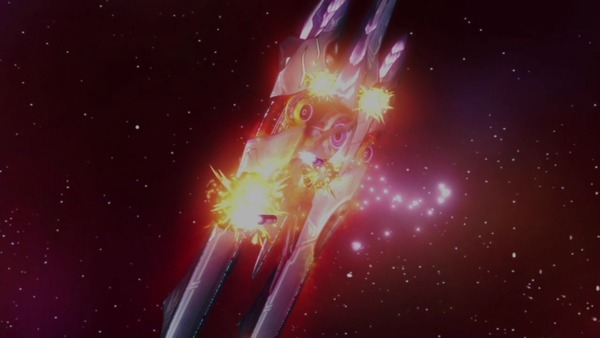 The pirates have seen enough of the Grand Cross and its firing and zig-zagging patterns that they can blind the enemy with chaff and sneak more weapons in when they try to evade them. Quartz is overwhelmed. I suppose there’s a point to be made here. Quartz tried to fly all three ships herself. And she’s defeated by a fleet of ships run by coordinated humans. A dozen against one. The hubris of advanced technology, or something like that. But it made the battle one sided, and therefore, disappointing. On the other hand, it was better than having the whole battle stages, or rigged, as the show has done so many times before. 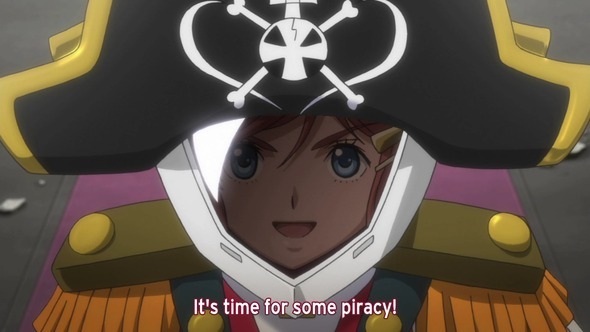 But in this story arc that was partly about the nature of piracy, Marika took me by surprise by doing something pirate-y. She boards the surviving Grand Cross. I had not expected that, which is why I’d probably make a lousy pirate. Once there, she meets Quartz and delivers an unsatisfactory answer to the “Why do we have pirates, anyway?” question by saying, essentially “Well, I’m a pirate. So there!” But the scene does manage to stress that there is a wider galaxy out there and that Marika should explore it, in fact some people dearly want her to. I suppose that’s what we’re going to get when the movie comes out. A good pirate captain never neglects her studies. 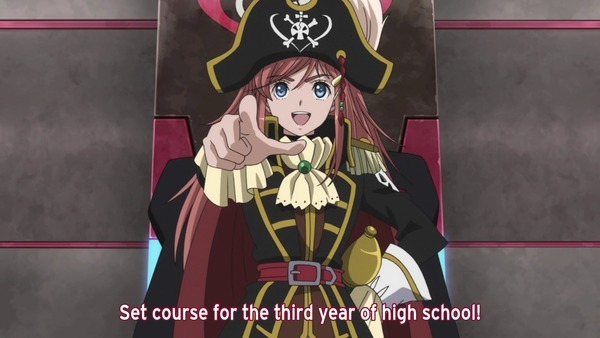 But for now, Marika has exams coming up. (I wish they had given us the hinted-at scene where the pirates learn why Marika scheduled the battle when she did) The show manages some rushed denouement. Ririka and KaneII talk about Marika. Chiaki has to figure out what she’ll do next. We need to see the yacht club girls again, of course. And it’s over. This show did well what two-season anime shows often attempt: give us a heroine and put her on a journey that changes and develops her, prepares her for a large conflict. It got annoying that Marika often went into these dangerous situations protected from real danger, but soon enough she did encounter real danger. I thought the Bentenmaru’s crew grew to trust her instincts too quickly, but that’s no big thing. She never let them down, and often surprised them with how good she was. That said, she didn’t really grow as a person. She was either Schoolgirl or Pirate. The other characters and story arcs were often silly, but the show was fully aware that it wasn’t really a big, serious space drama (just look at the title, er, titles), but a fun, slightly girly pirate adventure story. As for me, I started by wanting to mock everything in the show, but now it’s over an I wished there was more. Well done! Looking foward to the movie. 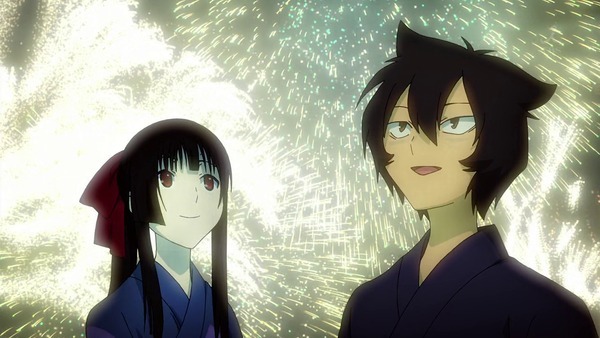 Sankarea could have ended decently at episode 11, but I suppose it was nice to have one more to take care of some issues. For the story, only two issues mattered. First was the Ranko/Rea rivalry. Nicely done by Ranko. Done in only one scene, she accepts Rea into the group, even putting on her yukata for her, while establishing that they are actually rivals. The other was what to do with Rea. Her basic situation had remained the same. She was pretty much limited to staying at home, dependent on the people around her… Okay, she’s a zombie now and the family she’s with is much nicer and isn’t keeping her from doing anything … but APART from that! I find this more interesting than the idea of her rotting away, since, right now, she isn’t. I was delighted when she decided to return to school. that’s a step forward. The only other issue, apart from the postponed rotting, was Chihiro’s occasional mumblings about whether he’s up to the responsibility. Since we know he actually is, it’s not worth spending the time on. So a mixed bag of a finale. This was a good series. The plot stumbled here and there. Some characters deserved more screen time, and not just with with highlight episodes like it gave Ranko and Meru. I would have liked to see them more involved in the action. On the other hand I bring this up because the characters were all a load of fun and deserved more. It was great to look at (a lot of shows are these days). I liked how it juggled the danger and the humor. So, are they planning another series? Natsuiro Kiseki gives us a more perfunctory finale than I expected. That was a sort of relief. Much of the episode dealt with trying to get the endless day to stop, and that meant leaving everyone satisfied. Yuka’s nagging complaint is solved when she gets through the audition without screwing up. That left Natsumi getting over Saki’s departure, and to my immense relief she manages to do that through sad glances and a nice speech at the rock before they undo the wish, or rather say goodbye to the wishes in general, I think. I’m not sure what the hell they were doing there. Nice touch that Rin’s mom knew about the rock but did not interfere in any way, trusting her daughter and the others to resolve it in their own way. So the wish ends, they finally get to move on. They managed the finale well, but then, this show did just about everything it chose to do well. It falls into the “much better than the premise” category. 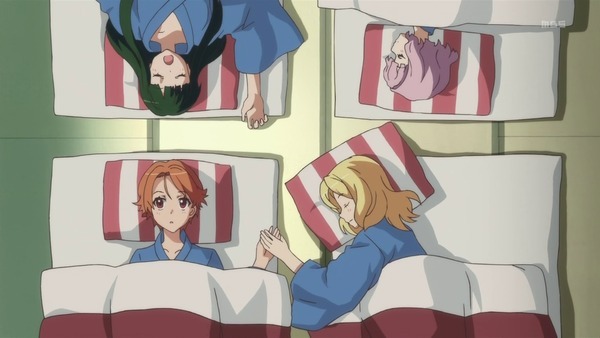 There was never a monkey’s paw wish or a “leave everything alone; that’s for the best” moral lesson shoved down our throats, well apart from Saki’s inevitable departure, but the girls never actually wished for that. They were sensible about their miracle. They used it to clean things up and make each other happy, and finally, to give themselves memories. A nice, unpretentious series. On his mother’s grave. Sheesh. Nazo no Kanojo X also had an unpretentious ending. There was little to it. Urabe meets with Youko, Tsubaki’s older sister and surrogate mom, who tells her a few thing about her late mother. This sparks a completely normal interest in Urabe. She asks Tsubaki to show her the grave, leaves appropriate offerings–and then she and Tsubaki exchange drool while touching the headstone. In a show full of sexual urges subsumed into odd everyday moments this one still managed to stand out. Though the dead mom seemed to like the idea, what with that flower blooming and those petals flying everywhere. But that was the only acknowledgment of the show’s weird premise. Otherwise it was simply about a girl who’s getting more interested in a boy and deciding she wants to take the relationship farther, not necessarily in a sexual way, though that’s implied, but by learning as much as she can about him. It’s appropriate. Some blogger said that the show’s source material may seem a little sick, but that it was actually a rather sweet love story. I don’t know if “sweet” is the word I’d use, though there were certainly moments. 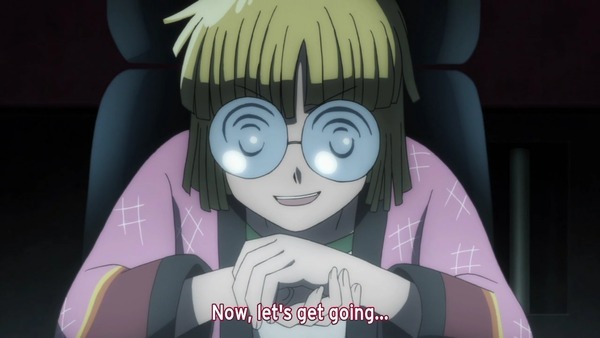 Urabe is a bit too odd and withdrawn, and control-happy, for that word. On the other hand we basically had the story of two kids doing their best at this romance thing who have a very odd bond between them. Good thing, too. If you took away the saliva, and the scissors, the show would have been dull. But couldn’t they have chosen anything other than exchanging drool? I never did get used to that. I watched Polar Bear’s Cafe as well, but it turns out this series runs 24 episodes. That’s fine. I’m not sure what I would do without my show to watch on Saturday or Sunday night when I’m too brain-dead to think rational thoughts. This week they worked on amiable schlub Handa’s crush on the cute Sasako. I’m all for this romance. 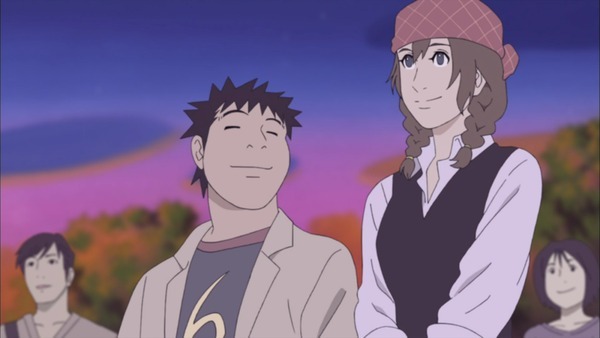 Handa deserves a girlfriend and Sasako couldn’t get a nicer guy. The show emphasized the possibility by showing her in loving closeups, something they have never done before, and Handa is made to be almost handsome. The other good bits in the episode were the Tanabana wishes and Full-Time Panda’s speech about the use of pandas in human relationships.